The Week in iOS Accessories: Cha-ching! 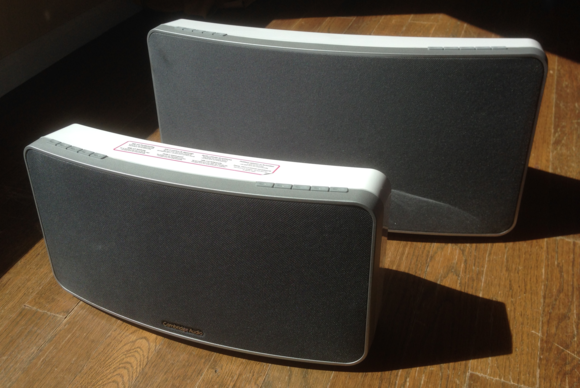 Cambridge Audio is the latest higher-end audio vendor to enter the market for compact, wireless speaker systems. The company recently introduced two versatile systems in its Minx line: the Minx Air 200 and the Minx Air 100. Each stands out from the crowd in part by offering dual wireless options: AirPlay and Bluetooth. The $600 Minx Air 200 takes up some space: It’s 17.7 inches wide, 8.7 inches tall, and just under 7 inches deep. It’s also hefty at 11.2 pounds. Along the top of the speaker are two groupings of buttons. The group on the left includes controls for pairing, stopping playback, adjusting volume, and toggling power; the row on the right offers buttons for Internet-radio presets (more on these in a bit). On the back of the 200, you’ll find a handle cutout, a connector for the included power adapter, an ethernet port, both RCA and 3.5mm (1/8-inch) auxiliary-audio inputs, a Micro-USB port (for service and potential firmware upgrades), and a dial for adjusting the bass level. Under the front speaker grille, the 200 hosts a pair of 2.25-inch Balanced Mode Radiator drivers and a 6.5-inch lower-frequency driver. Inside is an amplification system boasting 200 Watts of total power (hence the unit’s numerical name). The $450 Minx Air 100 looks just like its big brother, only smaller. It sports all the same buttons, the same cutout carrying handle, the same connections and controls on the back—it’s identical but for its size and power. The 100 is a bit lighter at nine pounds, and its dimensions are a bit smaller at 13.9 inches wide, 7.1 inches tall, and just under 6 inches deep. It includes just two speaker drivers: dual 4-inch, full-range versions, along with a passive bass port. And where the Minx Air 200 offers 200 Watts of amplification, the 100 pushes out—you guessed it—just 100 Watts. The Minx Air 100 is not so much a younger brother as a Mini-Me. Sonically speaking, the 200 is a beast. I love a speaker where I hear elements of songs I’ve never noticed before. The 200 served up acoustic surprises again and again. Bass is strong with the bass level set at the midpoint, and stronger than necessary if you dial it all the way up. Midrange and treble frequencies are well-represented, too, with nice clarity and punch. The 100 offers great sound, too—just less of it. Unsurprisingly, the 100’s bass performance isn’t nearly as impressive as the low-range-driver-packing 200, and the 100’s peak volume is quieter than the 200’s. Still, the smaller speaker puts out a lot of sound, and it’s a pleasure to listen to. It just can’t rival the full, powerful sound of the 200. Both speakers ship with three power adapters, for the U.S., the EU, and the UK, along with an ethernet cable and a tiny plastic remote. The remote lets you navigate ten Internet-radio stations, though the five preset buttons on each speaker provide access to only the first five. To configure the saved radio stations, you’ll need to grab the free Minx Air app. When choosing an Internet-radio station, it takes several seconds for the connection to the station to kick in, but the audio quality is pretty good. Were this review focused solely on the Minx Air 100, it would be effusive: The 100 is a great speaker with impressive sound for its size. But there’s a limit to the total effusiveness I can include in a single review, so I must save the bulk of my praise for the Minx Air 200, which is simply a tremendously impressive speaker. Both models stand out for their dual AirPlay and Bluetooth functionality, superior sound, bass adjustability, and Internet-radio options. But the Minx Air 200 is among the very best speakers in its class. Offering AirPlay, Bluetooth, Internet radio, and impressive sound quality, the Minx Air 100 is a standout system...but its bigger sibling, the Minx Air 200, is even better. Thanks to AirPlay, Bluetooth, Internet radio, and standout sound quality, the Minx Air 200 is among the best speakers in its class.